Music City Mike was on an excursion to the Musical Mecca of Athens, Georgia, to see the band Television play one of only three U.S. shows. My maiden visit to this college town, home of the University of Georgia Bulldogs, would allow MCM’s alter identity, the Pizza Snob, a chance to explore a new city as well. As my good fortune would have it, the promising Little Italy Pizzeria was only walking distance from the music venue (the beautiful downtown Georgia Theatre) and open until 4 a.m.! 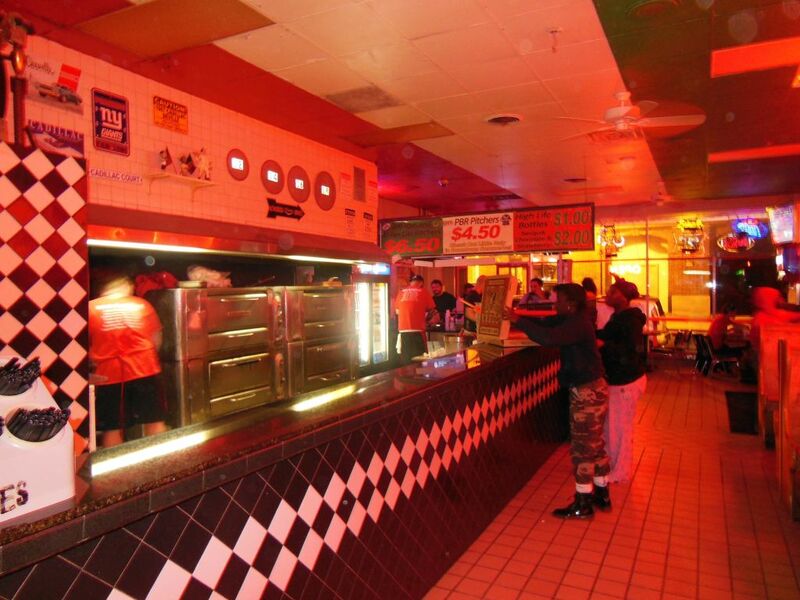 Providing late-night pizza to college students can be good business. However, according to a 2005 news story for which I could find no follow-up conclusion, it seems that the owner of Little Italy was alleged to have gotten involved in selling something off-menu to students—meth! 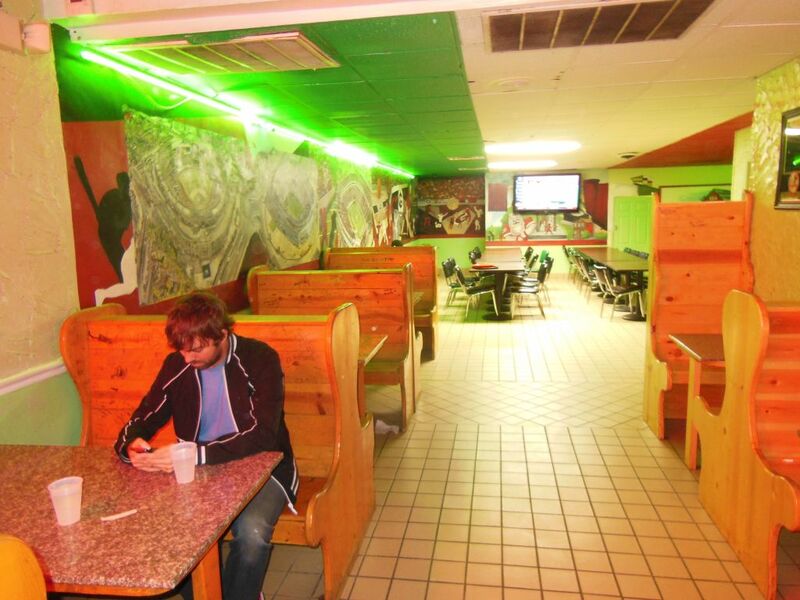 Well, didn’t that ruthless Gus dude on Breaking Bad run a chicken joint as his cover? 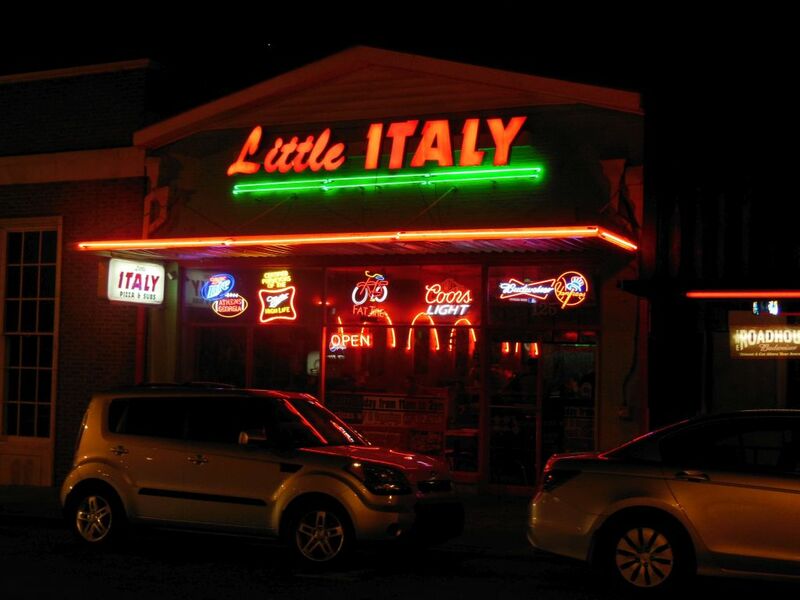 As far as pizza goes, Little Italy has been serving slices and such to Athenians since 1997. Started by a Yankee from Brooklyn, this place is a true old-fashioned pizza joint where slices are ordered from the counter and cooked in real pizza ovens. Little Italy has a big room in the back with plenty of space for students to hang out and watch sports on the big screen. Arriving downtown earlier than planned, me and the Clayman (who learned his lesson in Chattanooga about keeping his pizza simple) ordered up some pre-show plain cheese slices. The going rate was $3.10, and we selected thin over thick. Why we had to make such a choice was puzzling since this place looks like they should know the virtues of a thin, crispy crust over the puffy, doughy kind. After some reheating time, our slices arrived at the counter. They were a sight to see: colorful beauties with a heavy dose of sprinkled oregano embedded in a blend of mozzarella and tomato sauce glowing from a lush coat of olive oil. Taste-wise, Little Italy pizza really hit the mark. Our slices were piping hot, tasty, and downright delicious, truly a great flavor experience. The bottom crust was cooked crisp and tasted yummy and chewy. The end crust turned out dry and brittle. Using The Fold and Rip method, I also encountered a problem holding my slice up with one hand without it falling over— too much cheese creating slippage off the crust. This was a minor construction flaw. The concert was a true once-in-a-lifetime experience. For the sake of pizza journalism, the Clayman and I decided to try another Athens pizza place afterwards. It was tempting, though, not to revisit Little Italy instead: They certainly make one great slice of pizza that seems to be the best in Athens. Transmetropolitan has been open for 15 years now by ex Fellinis guys. 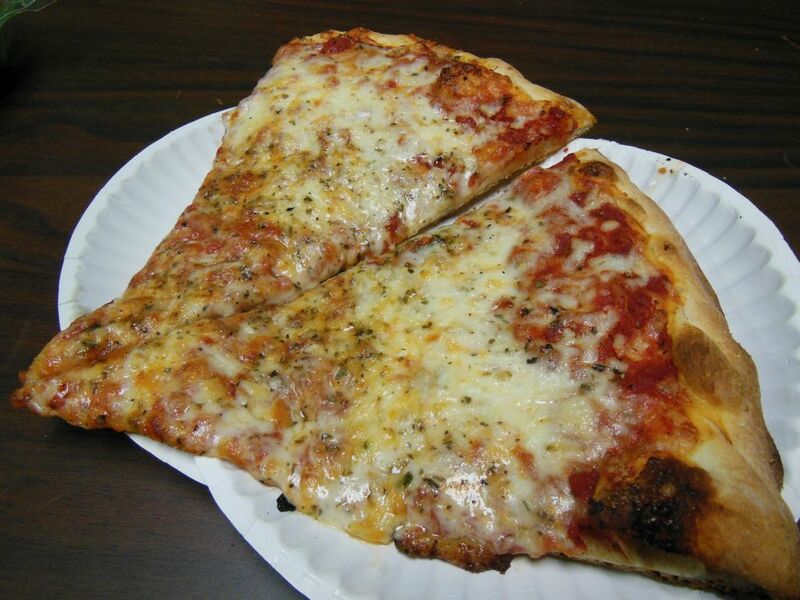 ← Chattanooga’s Community Pie—Launch of New York Style Pizza Is Almost Perfect!